Zucchinis are my new staple vegetable. Once upon a time I relied on tomatoes as my meal base. Then after overdosing slightly on tomato-based meals (and developing a slight a sensitivity to some nightshades), pumpkin became the new tomato. Now that the weather is warmer I am cooking my food less and less and have been looking for meals that don’t require roasting, stewing or baking. I’ve also been more or less grain-free for a year now. For the most part I’ve been pretty good at not eating bread, pasta rice and oats but I have always found pasta difficult to replace in meals. Zucchinis have presented a great alternative. Ok – we can’t pretend that zucchini is pasta, but it is bland enough to carry the sauce of the dish without carrying on about the fact that it is a vegetable and I have found sliced zucchini does an adequate job of separating layered ingredients in a lasagne. If you take the peel off first you can almost trick the kids … but my children are now used to zucchini in our dishes so they don’t mind any more. 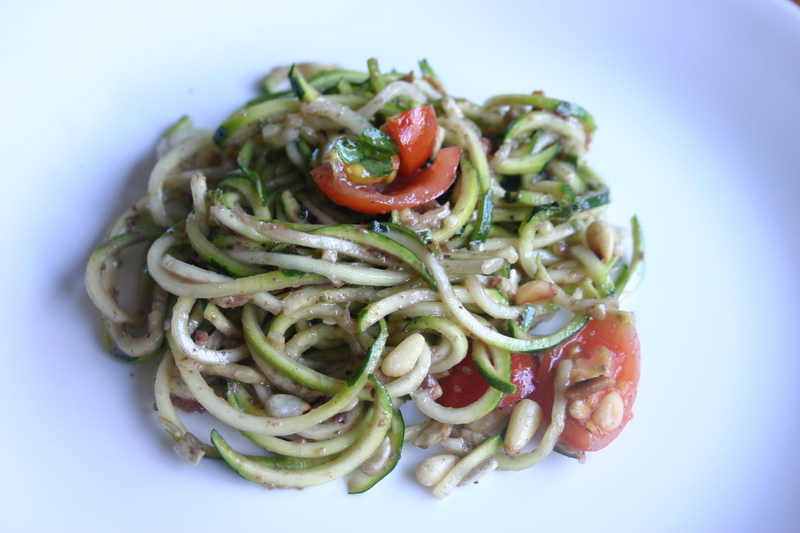 I use my spiraliser to make zucchini noodles. I don’t bother to peel them anymore, don’t mind the green edges to them. 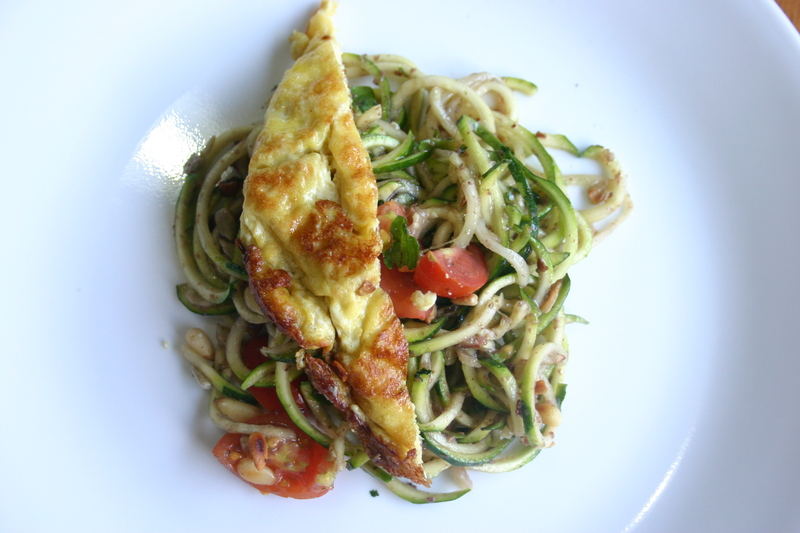 Zucchini noodles taste awesome when they have been sprinkled with a bit of salt and rubbed with some olive oil and left to marinate a bit. After a while they soften almost to the texture of pasta, and they carry sauces and pestos really well. In these photos I have mixed through some olive tapenade and served the noodles with cherry tomatoes, fresh basil, parmesan and toasted pine nuts and sesame seeds. For more protein I’ll top with an omelette or some pan-fried fish, chicken or sliced steak. I think it would be pretty awesome with grilled haloumi cheese also. This was our family dinner the other night. 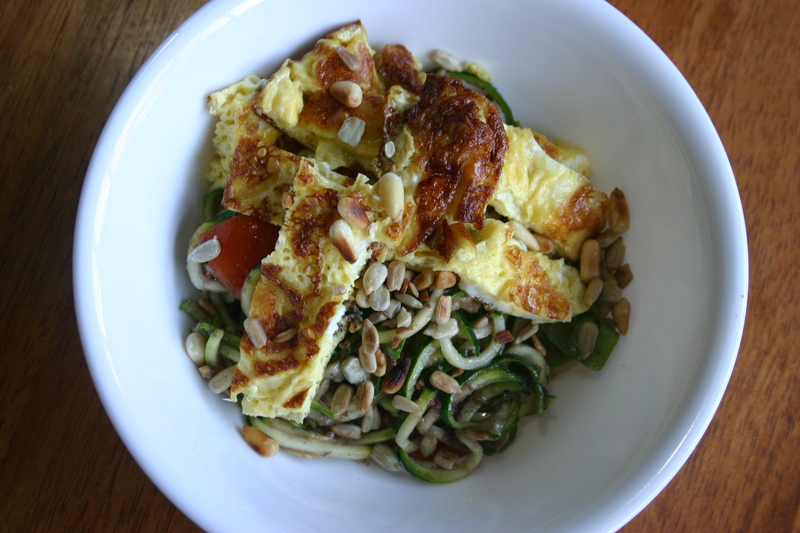 Zucchini noodle salad with sliced omelette. Everyone except the toddler ate it up – but the toddler doesn’t count. Her whims with food at the moment are very unpredictable. On the whole it was a delicious, fresh-tasting meal.